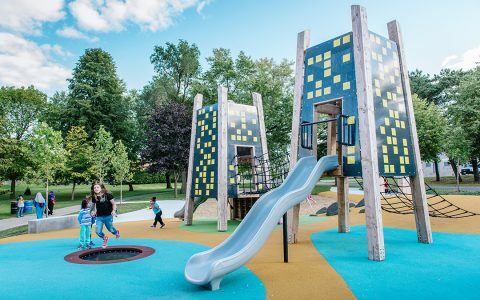 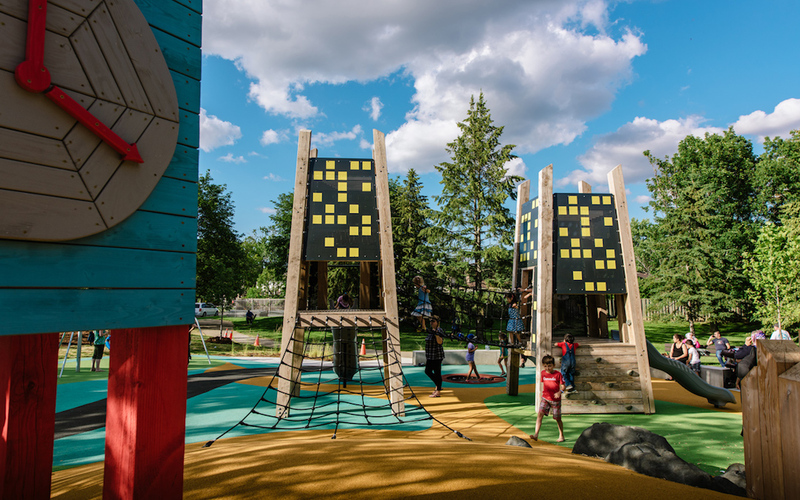 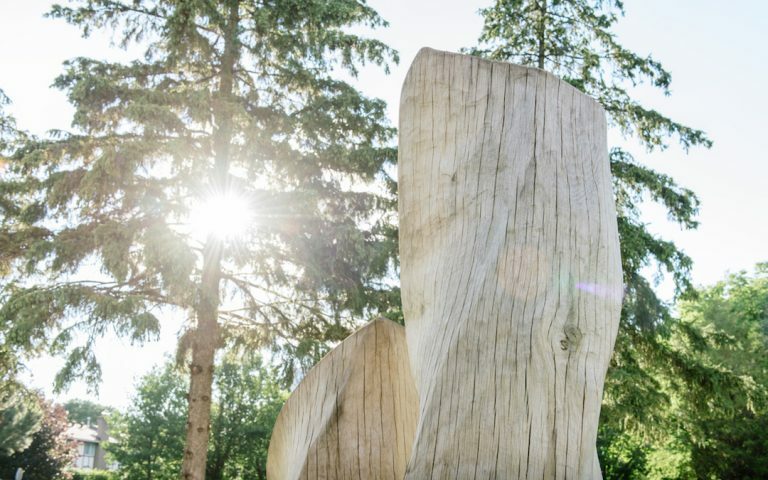 Inspired by some of the unique architectural features of downtown Mississauga, the custom designed accessible Jaycee Park playground in the City’s east is a colourful, innovative, inspiring and meaningful community space. 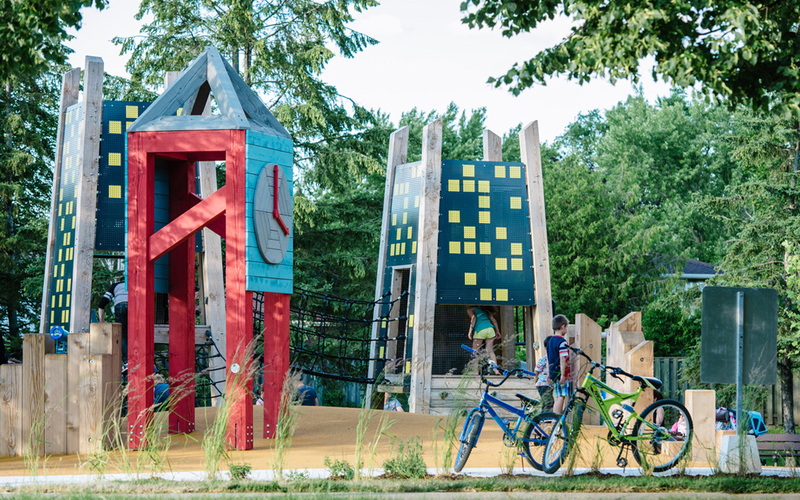 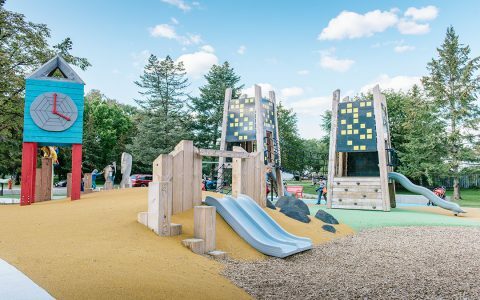 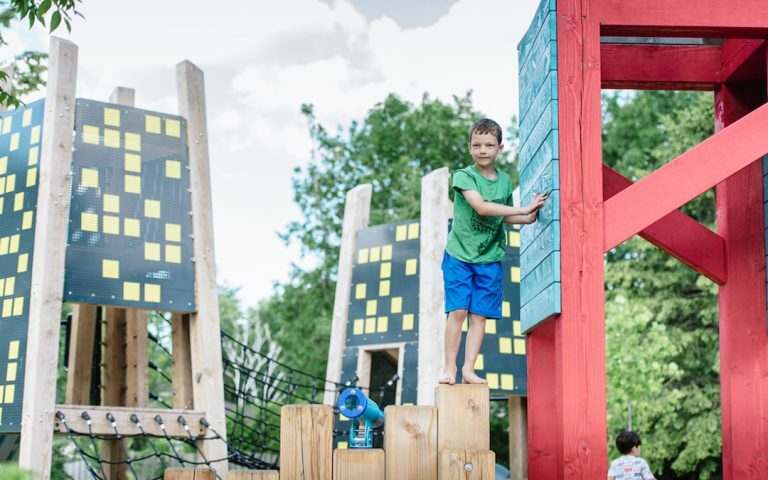 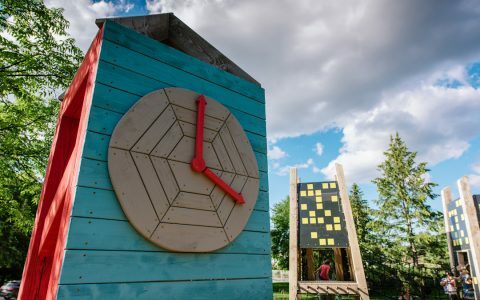 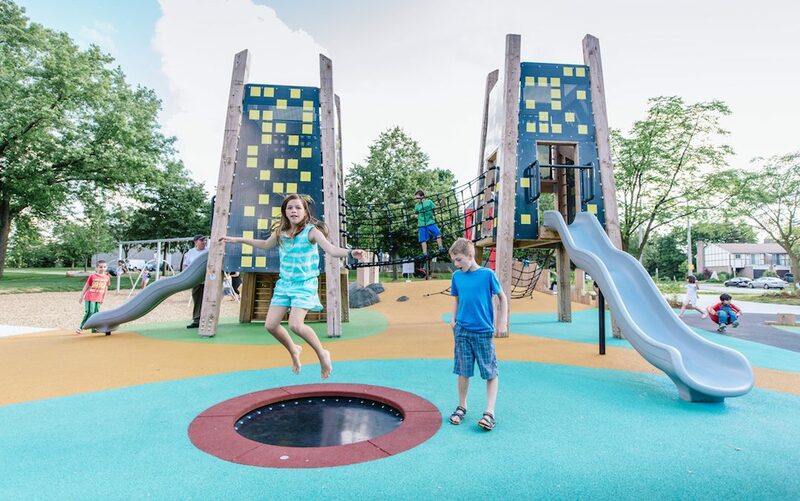 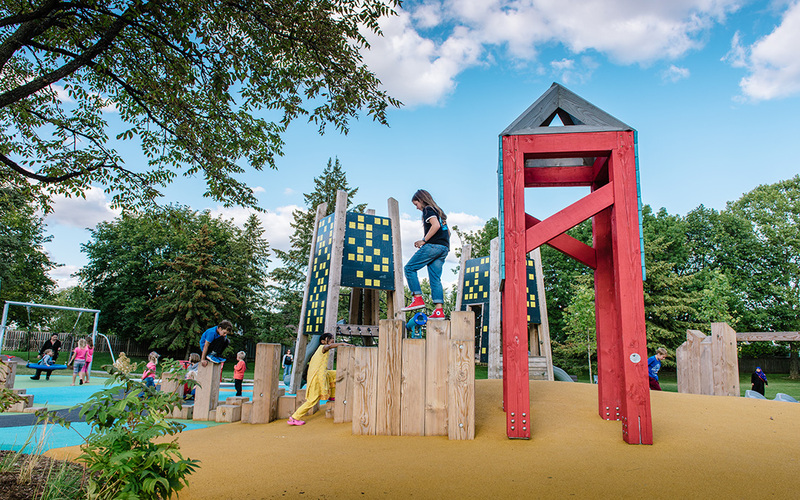 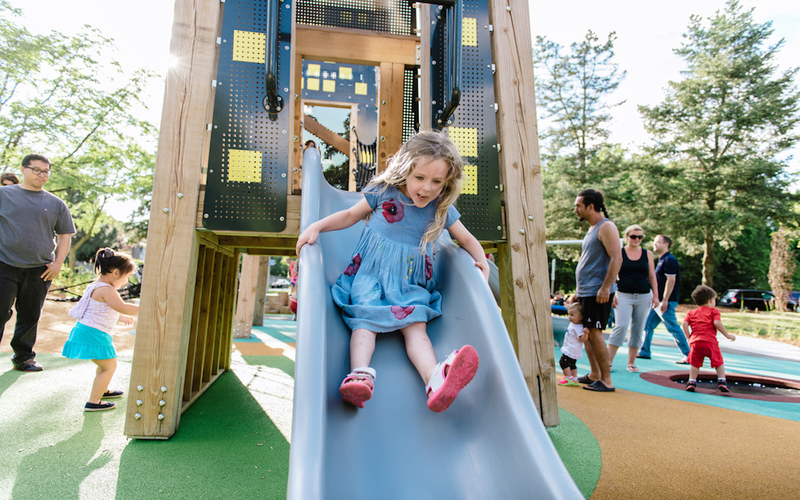 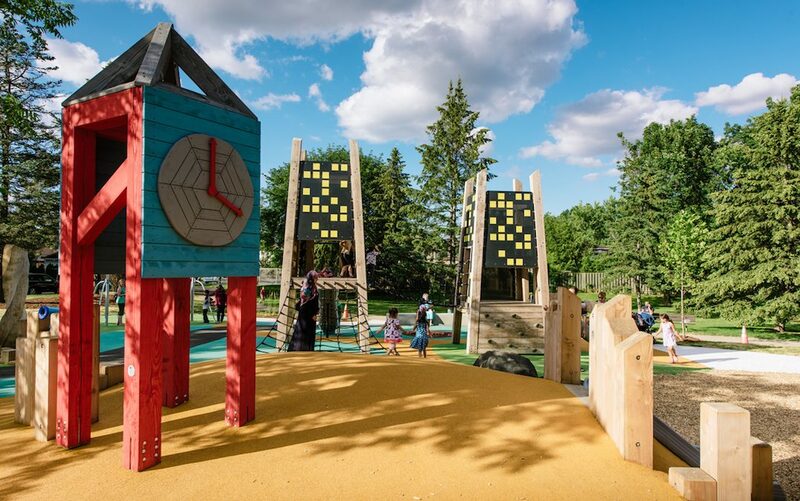 In this destination playground, play elements that represent the City’s skyline have been recreated on a smaller scale: the glowing night lights of the City’s skyscrapers can be seen on the two linked play towers; the twisting Monroe buildings are chain-saw-sculpted from local trees; and the City Hall’s colourful clock tower adds connection and whimsy. 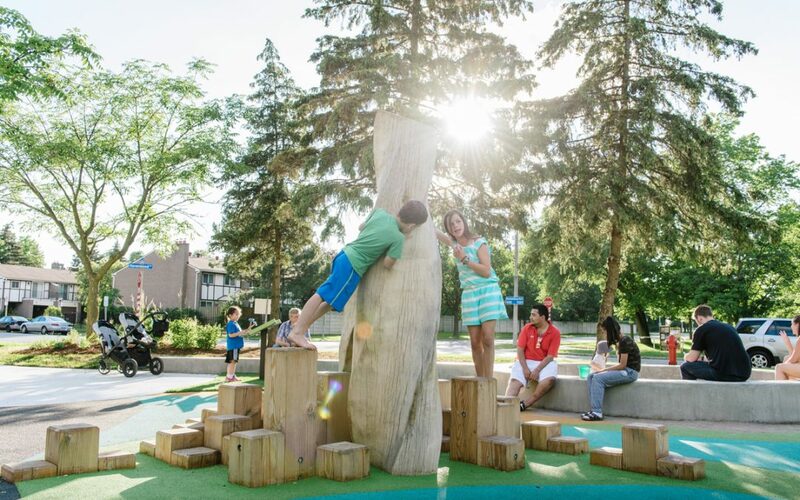 Envision a child from the Burnhamthorpe, Applewood Hills and Summerville neighbourhoods first visiting Mississauga City Hall and realizing that City Hall has a clock tower just like his/her playground; and those condominium towers, locally known as the Marilyn Monroe towers (Absolute World) are the same shape as the twisting tree sculptures in his/her playground! The two skyscraper towers allow children to experience the park from up high by scrambling up nets to reach a suspension bridge and slides. 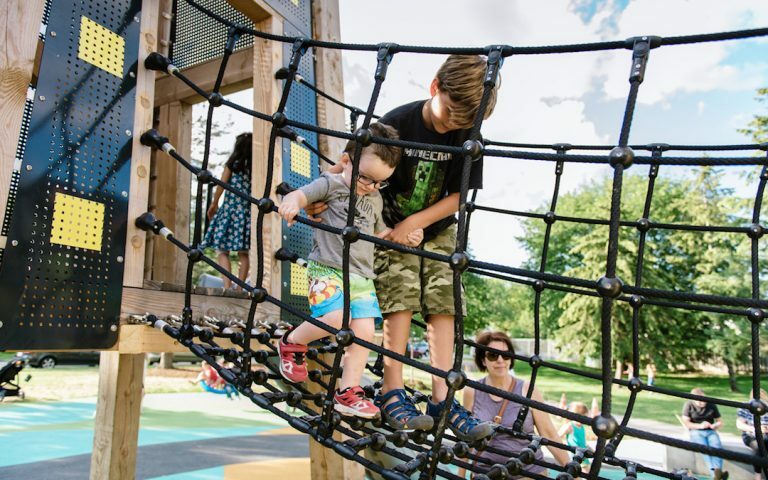 The site also provides a multitude of physical stimulations through the wheelchair accessible ramps and adaptive swings to allow children on to the playground equipment. 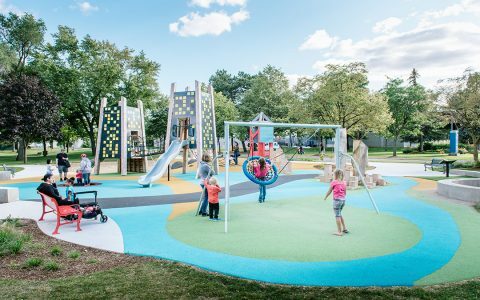 Extensive use of poured-in-place rubber surfacing on the site ensures easy access for users with mobility devices. 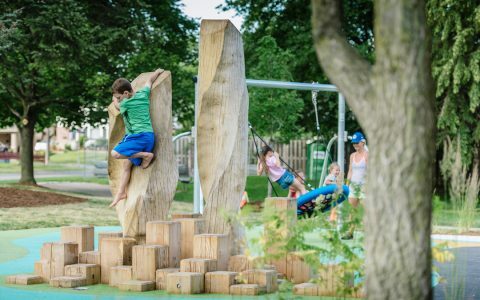 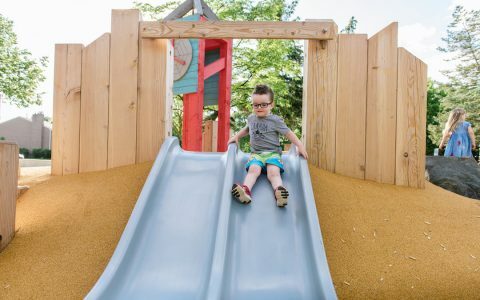 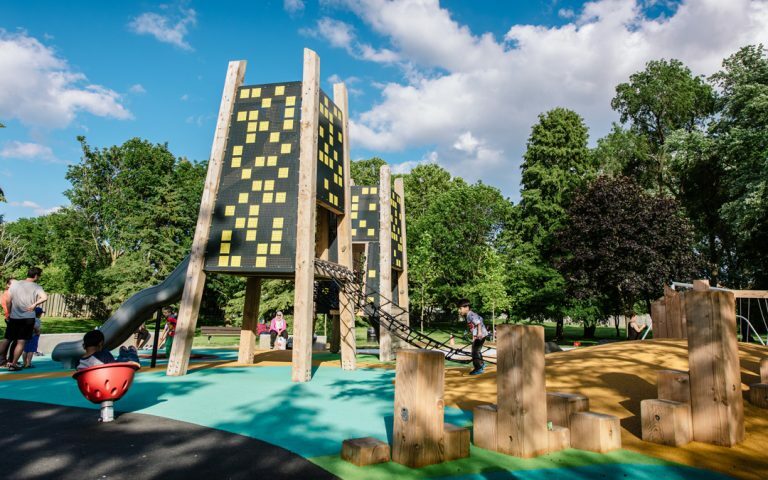 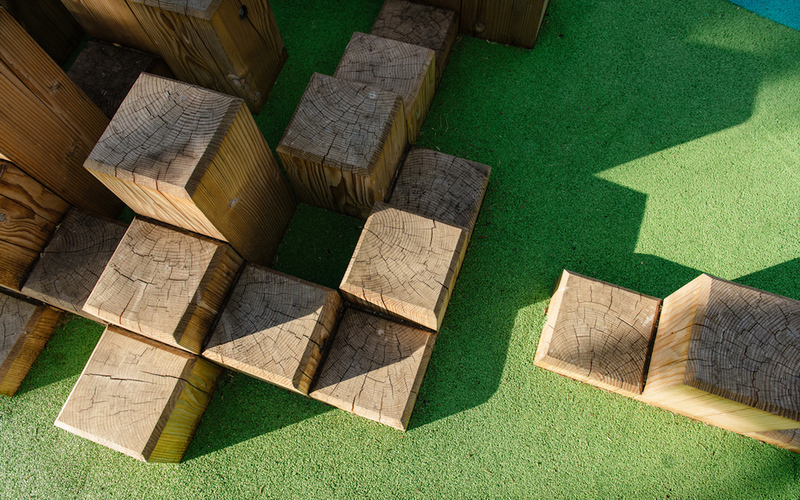 Its innovative application on sloping surfaces means children can safely run or wheel up and down small berms that lead to timber steppers and a telescope. 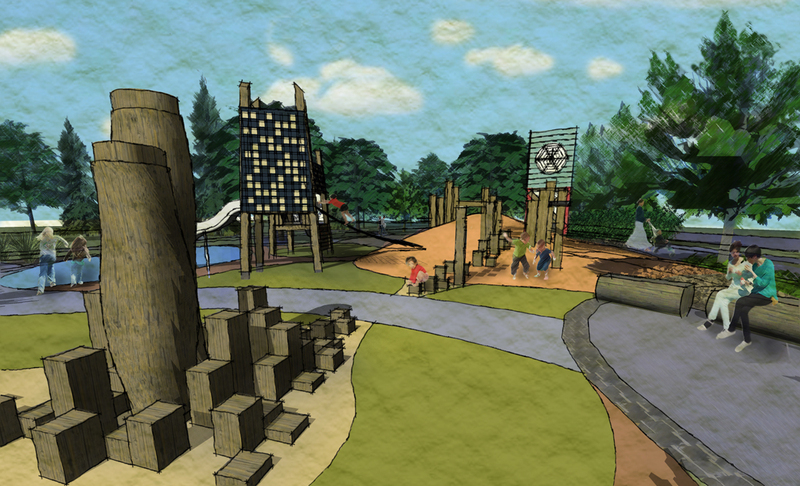 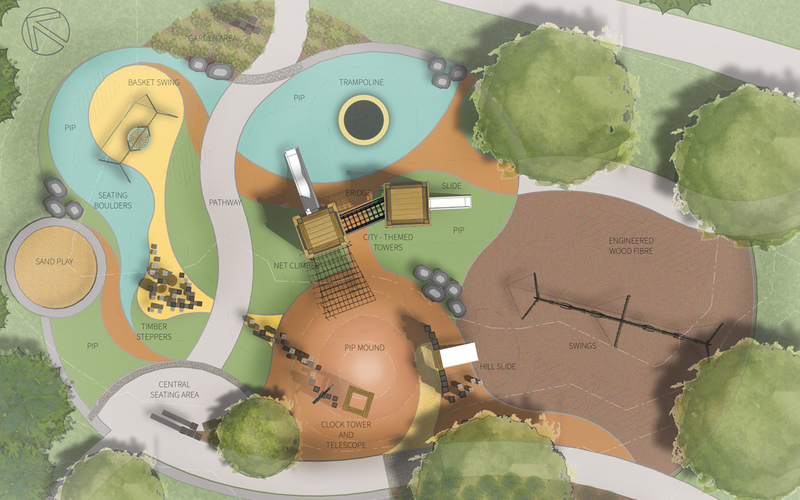 The site includes both accessible swings (on PIP surface) as well as a larger bank of traditional swings. 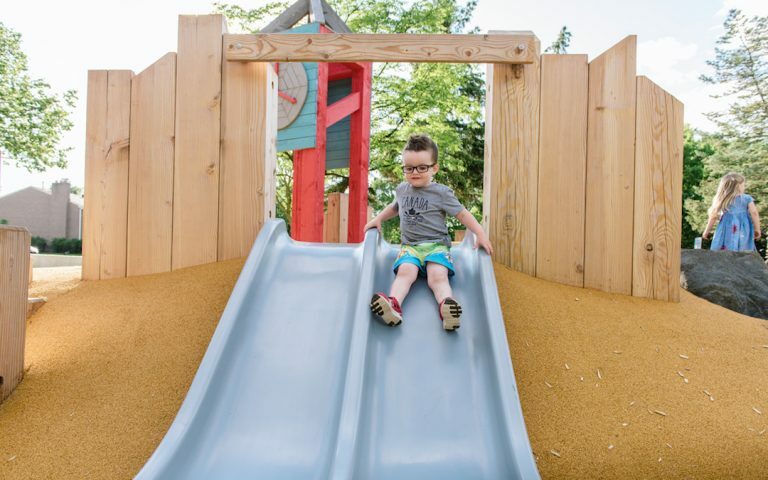 An at-grade trampoline will attract all ages to jump and play, while the sand play area is devised for discovery and experimental play. 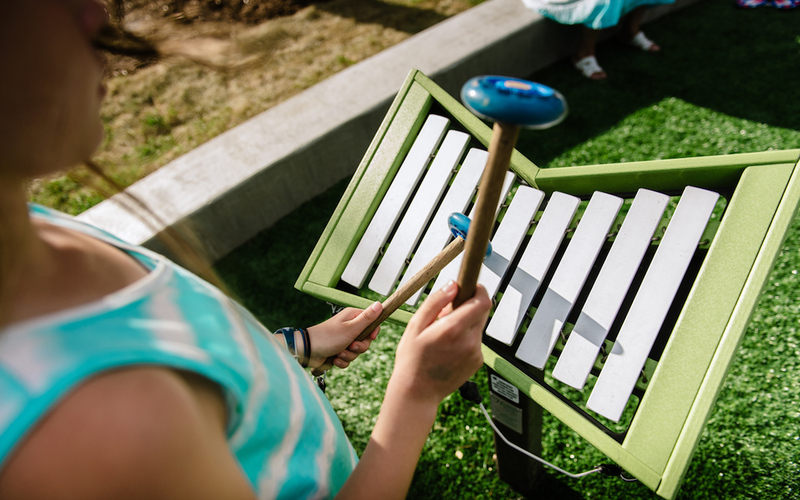 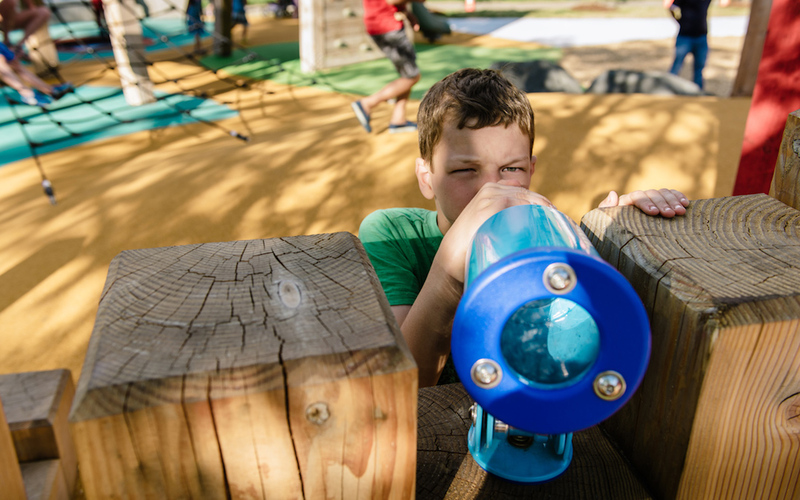 The barrier-free, fully accessible playspace at Jaycee Park is fun and unusual. 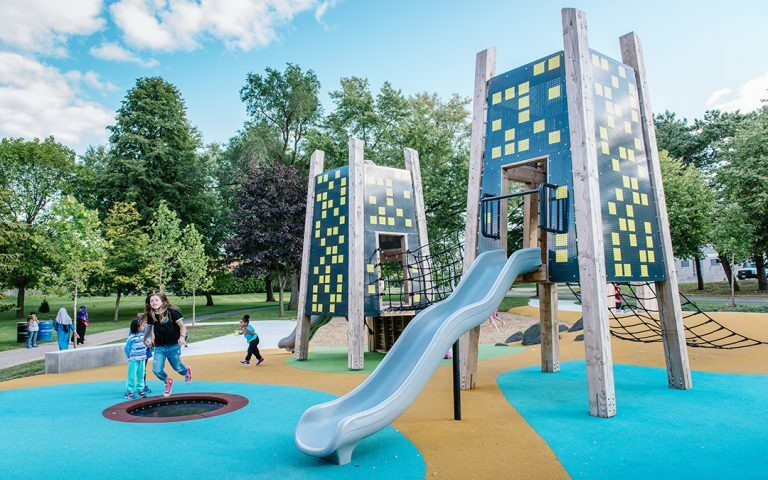 The city-themed details create a sense of awe and wonder for children and adults. 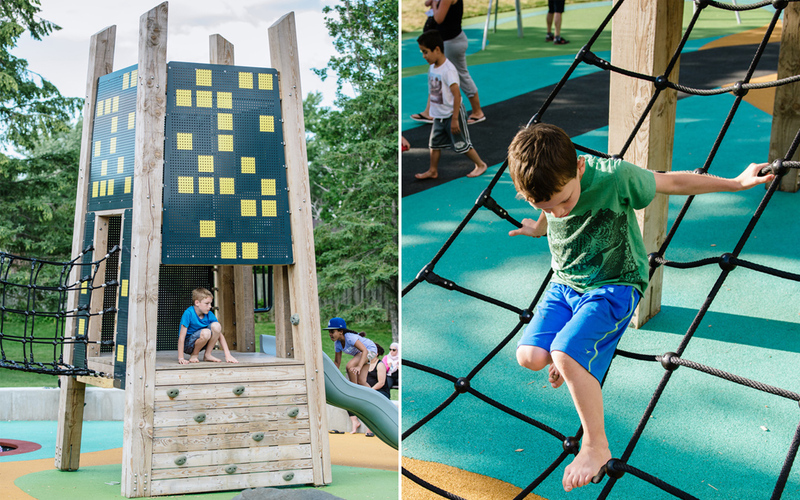 Jaycee Park was recently identified in Today’s Parent magazine as one of the best inclusive/barrier-free playgrounds in Canada.